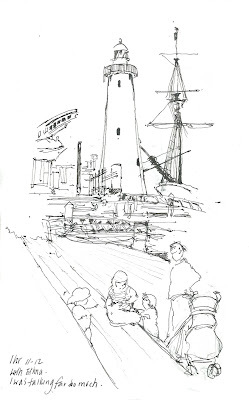 Just realised I forgot to post my sketch from the National Maritime Museum a couple of weeks ago. I love this ship. 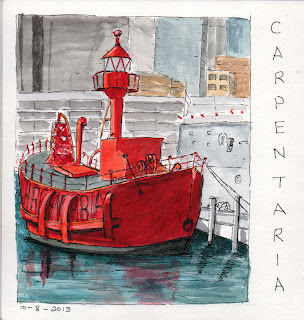 It is a lightship. 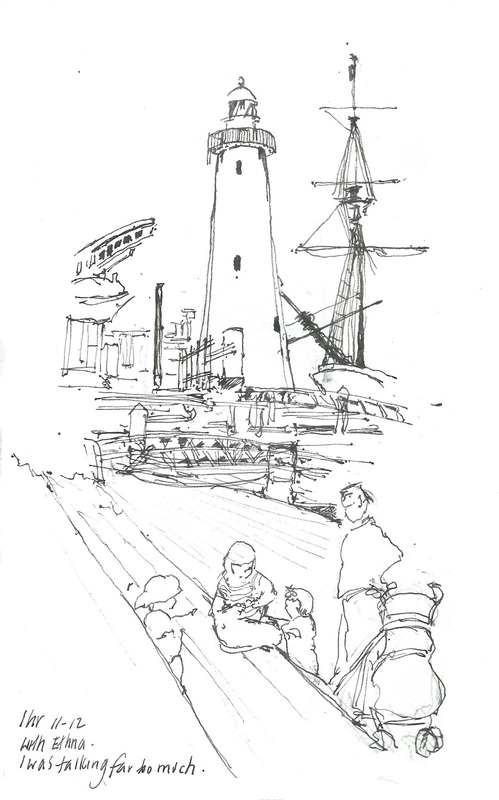 Trivia: a lightship's birthday is the anniversary of the day the light was first turned on. 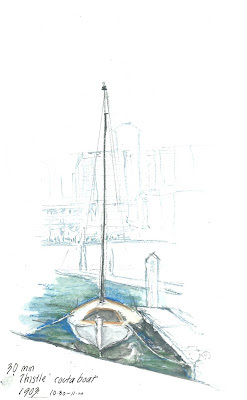 This one was on duty on the Queensland coast for many years, and now is at Darling Harbour. It is the brightest of bright vermilions. 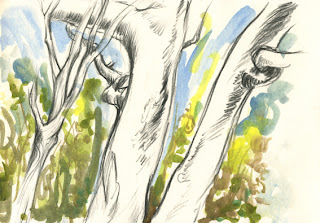 It is one of those things I like to draw at least once a year. 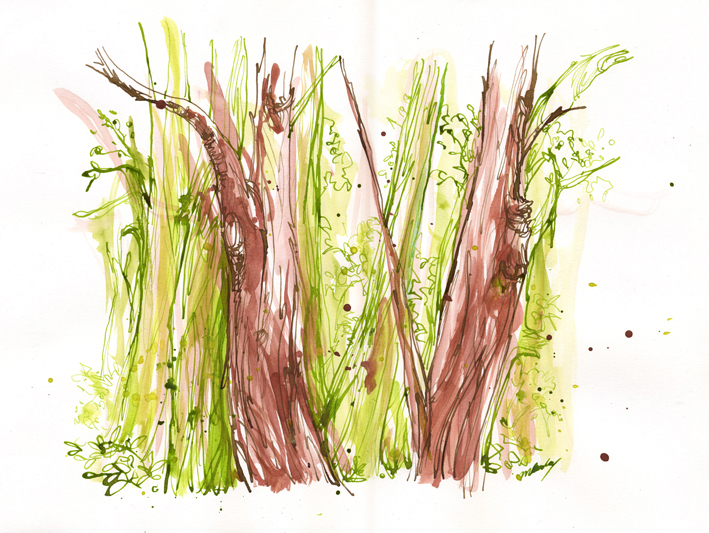 My waterbrush was playing up and flooding the paper at times. A warning to me to take a new one on my travels. 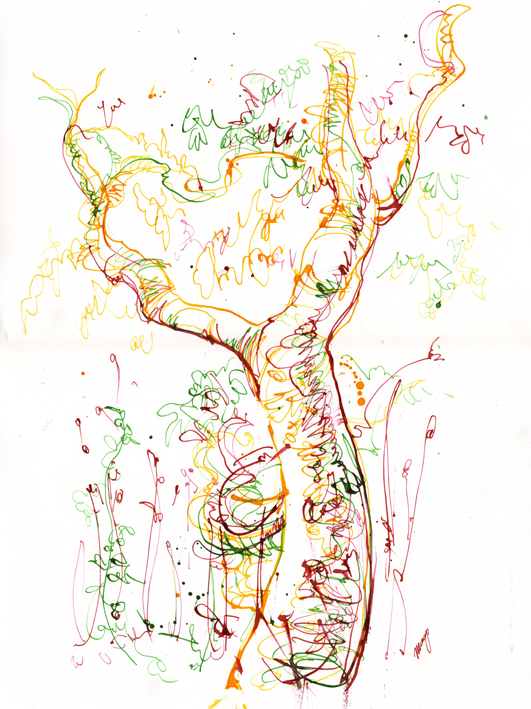 I drew this back in 2010, as seen here, with the light falling on it in different ways. Then I turned one of the sketches into a solar plate etching which (so far) I have printed in two different colours. I am always happy to draw this little ship. It has such a strange barrel-like shape that it is always a challenge. Isn't it wonderful when we have such stunning weather in winter? Warm enough to be at the beach and even put my feet in the water. Urban Sketchers in Sydney met at the National Maritime Museum in Darling Harbour on a glorious sunny morning. 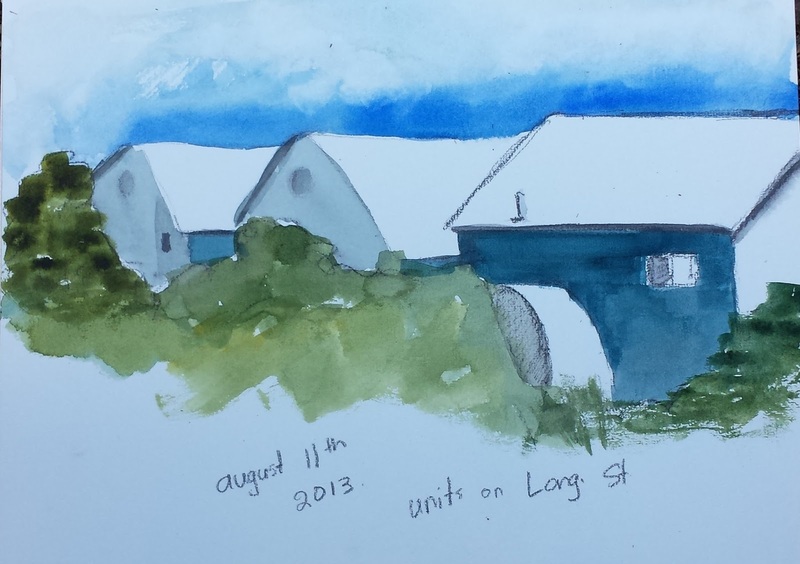 Liz was not able to attend, but ten of us sketched from 10am til 12.30, some continuing on after lunch. Anthony, Jennifer, Annie, Wendy, Chantal, Ethna, Phil, John and Peter are in the photo below. Phil showed great enthusiasm and had a very early start to the day, travelling from Lake Macquarie. 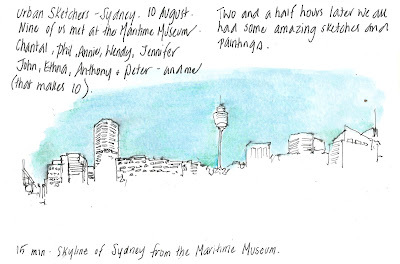 There is so much to sketch outside the Maritime Museum, without even entering its doors. Lots of old and new boats, the lighthouse, city skyline, tourists, to name a few. It was hard to know where to begin. I am still on a holiday high, even though I returned from Barcelona and London two weeks ago. Scanning my drawings every night helps me continue this feeling, as does sharing my experiences with anyone who will listen ! 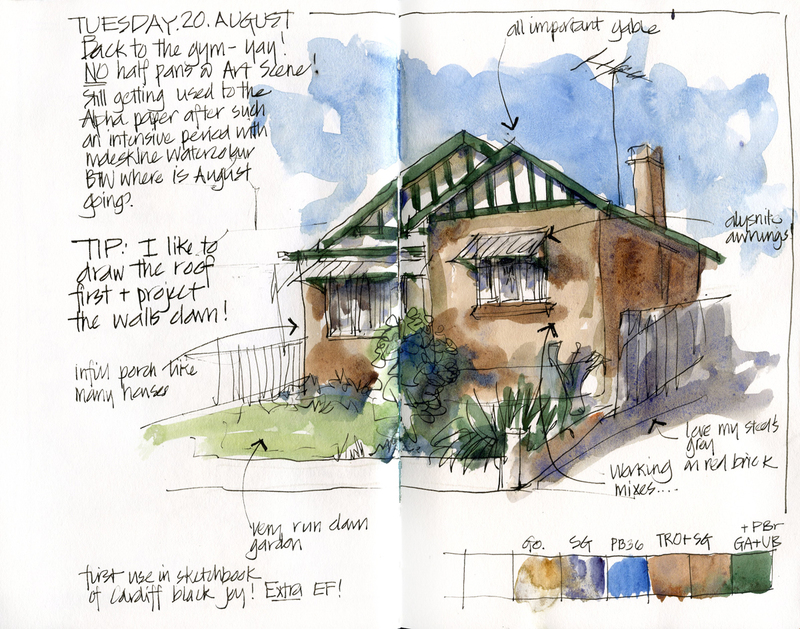 I gave an overview of my Barcelona Urban Sketching Symposium experience and was happy to talk to anyone who had questions. I began with a little 1903 built boat, moored amongst the tallships and warships. I consciously tried to think about some of the lessons that I learned at the Barcelona Urban Sketching Symposium. 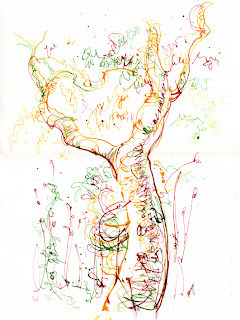 For this I recalled the discussions at Barry Jacksons wonderful "Hither Thither and Yon" workshop. I concentrated on the Thither space. I leant SO much at Barcelona, both in the Workshops and from other participants I spoke to. 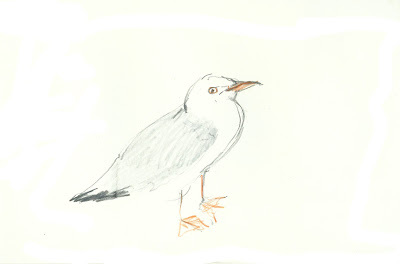 I realised that in my drawings I am building on the generous knowledge and advice shared by many online artists. 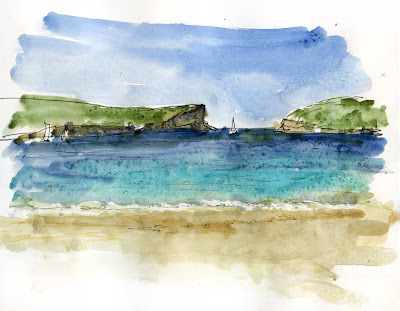 From Kate Johnson, one of the many techniques I use is the Derwent Blue Grey (not watercolour) to draw the background buildings It is a nice soft tone and colour. I then sat down with Ethna and distracted her by chatting. After an hour I moved on. Please join us this month-end. 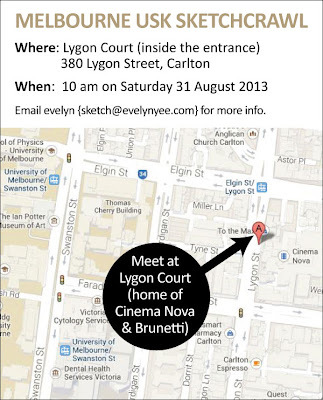 We will meet at 10am on Saturday (31 August) inside the entrance of Lygon Court (where Brunetti and Cinema Nova lives). 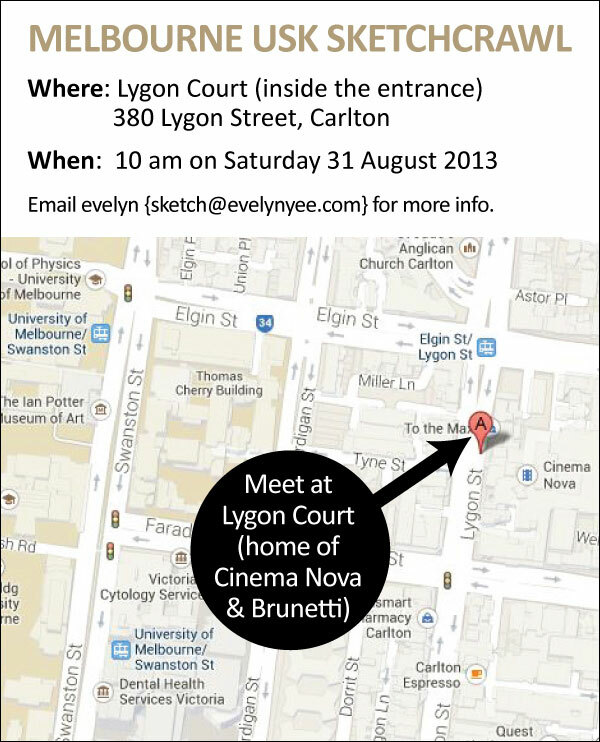 There will be lots to draw - street scenes, Italian food, tourists, La Mama etc. It will be a casual and fun day - it will be enjoyable to draw with others, learn and there is usually lots of laughter. We will draw for a couple of hours, then catch-up to share what we have done. 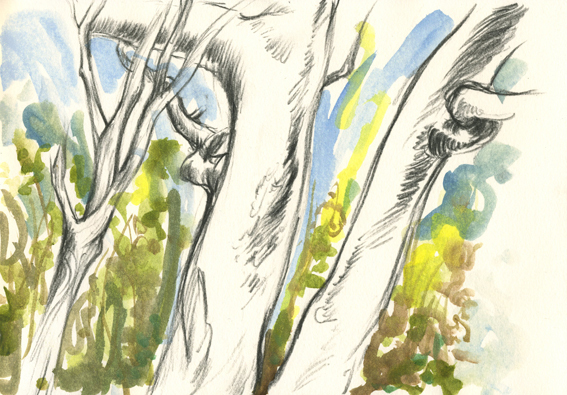 And if you wish, stay on for coffee and/lunch, and continue drawing. 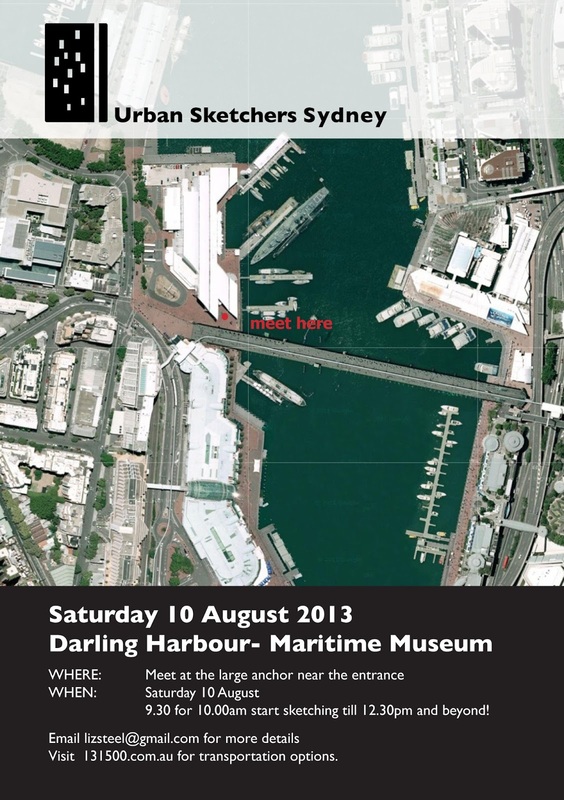 See map below for more details. There are many trams that will get you there. I am looking forward to it. As before, rain or shine, we will be there. I will wear my red scarf in case it's your first time meeting us. Please email me if you have any question. See you then. Today, I decided to sketch in a storm water drain. These structures are all over Brisbane, open drains to channel the excess water from the heavy rains we get out into the bay via the many creeks we have. Sadly, folks think these drains are their personal garbage dumps. There were all kinds of garbage in there, from plastic bottles, cans, cardboard, what looked like the remnants of a shopping trolley, and lots of plastic from cast off plastic bags. There is plenty of wildlife living in these ditches, Mallard ducks, Australian Brown Ducks, and visiting Egrets.. I didn't get close enough tot he water to see if there were any fish in there, I didn't have my gumboots. 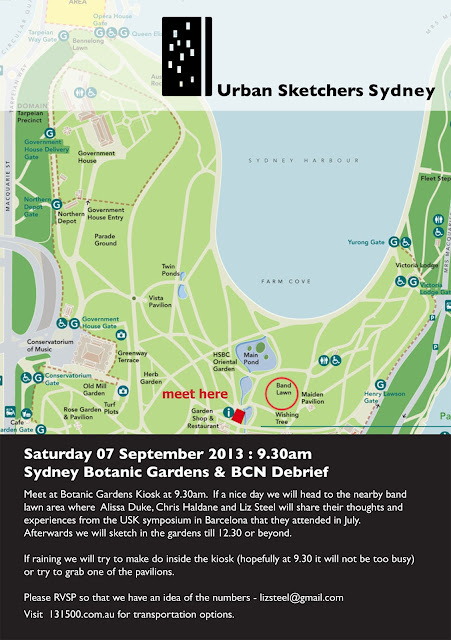 Sadly I didn't have a plastic bag either, to carry the smaller pieces of garbage away..
USK SYD event this coming Saturday... hope to see you there! I was asked to participate in an event held at Wolli Creek's Iloura Reserve as a sketcher. Initially it was to hold workshops but convinced the organisers, the Wolli Creek Preservation Society, that something a bit more casual would be better suited. So I sat at various locations and made sure there was plenty of spare material for anyone that wanted to join me. Most were kids, sadly adults seem inherently intimidated by blank sheets of paper. Anyway, it did give me more time to play. The WCPS are trying to raise awareness about this thin strip of bushalnd found in the inner south-west of Sydney. Caught in between residential areas and a motorway, they are hoping to dissuade any plans to bulldoze through to extend the motorway. 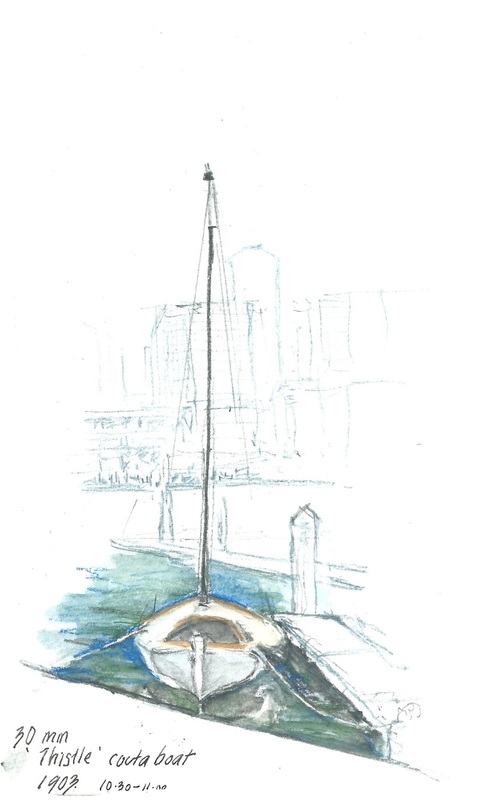 This year's theme was about Wolli Creek being an inspiration to the arts and creativity. They had us sketchers, musicians, poets, photographers and arts and crafts activities happening on the day. If you would like to see more of my work from this day and other visits to the reserve please visit my blog here.